Primary or idiopathic failure of eruption is a condition described by Profitt and Vig, whereby nonankylosed teeth fail to erupt fully or partially because of malfunction of the eruption mechanism. This occurs even though there seems to be no barrier to eruption, and the phenomenon is considered to be due to a primary defect in the eruptive process. Terms such as arrested eruption and noneruption have been used interchangeably to describe a clinical condition that might have represented ankylosis, impaction, or idiopathic failure of eruption. These terms refer more to the pathogenesis of DTE than to the benchmarks that define DTE. Embedded teeth are teeth with no obvious physical obstruction in their path; they remain unerupted usually because of a lack of eruptive force. Submerged teeth and inclusion/reinclusion of teeth refer to a clinical condition whereby, after eruption, teeth become ankylosed and lose their ability to maintain the continuous eruptive potential as the jaws grow. Such teeth then seem to lose contact with their antagonists and might eventually be more or less “reincluded” in the oral tissues. This condition should not be confused with chronologic delayed eruption, because the eruption was normal according to both chronologic and biologic parameters (root formation), but the process was halted. Paradoxical eruption simply has been used to represent abnormal patterns of eruption and can encompass many of the above conditions. (2) biologic eruption, as indicated by progression of root development. Chronologic age has been used quite often to describe DTE. The advantage of using chronologic norms of eruption lies in the ease of use. Although not necessarily representating biologic age, expected time of tooth eruption often helps in forming a baseline for further clinical evaluation of a patient. Eruptive movements are closely related clinically with tooth development. Tooth eruption begins after root formation has been initiated. During eruption of teeth, many processes take place simultaneously: the dental root lengthens, the alveolar process increases in height, the tooth moves through the bone, and, in cases of succedaneous teeth, there is resorption of the deciduous tooth. These parameters are currently used as clinical markers for orthodontic treatment planning. We propose a classification scheme that takes into account these parameters, allowing the clinician to follow a diagnostic algorithm for DTE and its etiology. In this scheme, we sequentially examine several aspects of tooth eruption. First, we examine the patient’s age and clinically apparent dentition. We define as chronologic DTE the eruption time that is greater than 2 SDs from the mean expected eruption time for a specific tooth (chronologic norm of eruption). A second step includes determining the presence or absence of a factor that adversely affects tooth development. This will prompt the clinician to consider certain diseases that result in defects of tooth structure, size, shape, and color. If tooth development is unaffected by any such factor, the third step is to consider the patient’s dental age as evidenced by root formation. Normal biologic eruption time is defined as tooth eruption that occurs when the dental root is approximately 2/3 its final length. Delayed biologic eruption is defined as tooth eruption that has not occurred despite the formation of 2/3 or more of the dental root. Thus, if a patient has chronologic delayed eruption, he or she might simply be of a dental age that does not fit the norms (root length less than 2/3). The process of normal eruption and the source of eruptive forces are still controversial topics. This section reviews reported mechanisms that lead to DTE in some local and systemic conditions. 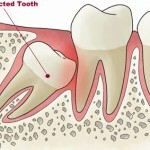 Physical obstruction is a common local cause of DTE of at least 1 tooth. These obstructions can result from many different of causes, such as supernumerary teeth, mucosal barrier, scar tissue, and tumors. DTE has been reported to occur in 28% to 60% of white people with supernumerary teeth. Supernumerary teeth can cause crowding, displacement, rotation, impaction, or delayed eruption of the associated teeth. 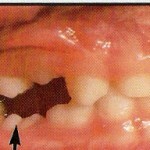 The most common supernumerary tooth is the mesiodens, followed by a fourth molar in the maxillary arch. Different forms of supernumerary teeth have been associated with different effects on the dentition; the tuberculate type is more common in patients with DTE, whereas the conical form has been associated with displacement. Odontomas and other tumors (in both the deciduous and permanent dentitions) have also been occasionally reported to be responsible for DTE. In many of these case reports, the DTE was actually the alerting sign for diagnosing these conditions. Regional odontodysplasia, also called “ghost teeth,” is an unusual dental anomaly that might result from a somatic mutation or could be due to a latent virus in the odontogenic epithelium. 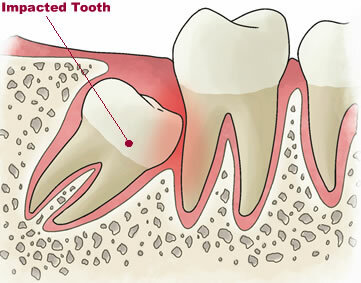 Affected teeth exhibit a delay or total failure in eruption. Their shapes are markedly altered, generally very irregular, often with evidence of defective mineralization. Central incisors, lateral incisors, and canines are the most frequently affected teeth, in either the maxillary or mandibular arch, and deciduous and permanent teeth can be affected. 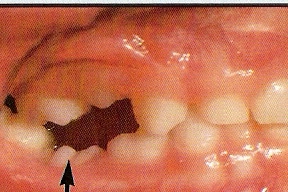 Abnormality in the tooth structure itself might be responsible for the eruptive disorders seen in this condition.